If you have been trying to avoid the technology revolution going on around you, maybe it's time to give up and join the fray. After all, research now shows more than 50% of shoppers in the US will begin product searches on Amazon. That is a huge shift from years ago, shows how fast things can change and demonstrates technology advancement cannot be stopped. For bankers, we reflect today on a new basic smart watch coming soon to America. Visa is partnering with Swiss watchmaker Swatch in an effort to streamline payments. A prototype of this new watch was tested in Switzerland, China and Brazil during the Olympic Games. It makes payments within seconds using pre-loaded funds taken from the wearer's bank account. It is known as the Swatch Bellamy watch, which is a tribute to visionary Edward Bellamy who imagined a future without cash way back in the XIX century. Also of note is that the smart Swatch has no Internet connection. Instead, inside it is an NFC antenna and a contactless chip similar to the Apple chip. This technology uses high frequency radio waves to communicate over short distances. As with other payment watches, the proud owner of the Swatch just has to get close to a Visa contactless terminal and the payment is concluded. Unlike those competitors, this new smart watch does not require an app to access account information through the watch. There are no fancy alerts and the watch does not allow people to check balances either. Rather, it concentrates just on providing the time and to make payments. 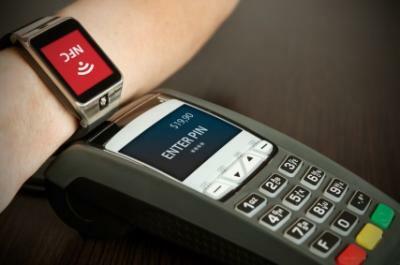 Visa touts that the watch eliminates the need to carry cash, debit or credit cards. Visa announced late last year that the Swatch would be available in America, but the company decided to first test it in other markets. Visa concluded an agreement with China Union Pay, which controls most of the card processing of the country. For many Chinese consumers, watches are a status symbol, so the market is huge. Visa was also a big sponsor of the Rio Olympic Games. There, it announced the introduction of three wearable financial innovations that included a payment ring, a band and the new Bellamy Swatch watch. Visa partnered this time with a Brazilian company, where customers could buy four different models at Swatch retail stores for about $90. They could then pre-load their accounts with funds and use the 4,000 contactless terminals that Visa had installed around Rio to recharge funds on the go. The reasonably priced Bellamy is interesting as it is a cheap but smart way to perhaps accelerate wearable adoption rates among the masses. For its part, Bellamy rides on Apple Pay's success, but comes at a much lower price point. Financial institutions that support such trends may be able to attract new customers and indulge them in spur of the moment purchasing. As a quick refresher, back in 2014, early adopters bought 7mm units of smart watches. As things stand now, projections point to an explosion of 650mm by 2020 (all brands combined). We will have to wait and see if this new watch and approach will see heavy adoption, but it is at least interesting to consider as you think about where the payments space is heading and how fast things are changing. After all, just look at Amazon. Lower Japanese and European rates prompted a 3bp fall in US yields. The latest FDIC supervisory insights report finds IT was cited in approximately 22% of the satisfactorily rated institutions with Matters Requiring Board Attention (MRBA) during the past 2Ys; this level indicates that IT and cybersecurity should be an area of increasing focus by bank management and boards. Research by the Society for Human Resource Management finds the average executive level employee has 7 direct reports, with a median of 5. Research by Ally Financial finds only 36% of consumers with credit cards use those cards for everyday purchases, missing out on rewards. It is estimated that millennial workers will comprise 50% of the workforce by 2020, while Gen X and Boomers will be about 20% each. Research by Javelin and KPMG finds transaction costs are up to 13x higher in a call center than a mobile channel. Research by Korn Ferry finds 97% of executives globally say they work during vacation and 65% said they don't expect to use all of their vacation time during the year. Research by ThreatMetrix and Ponemon finds 40% of millennials and 26% of boomers say fraud risk is lower on a smartphone or tablet than on a desktop or laptop computer. Research by Deloitte finds the top 5 "must haves" people look for when choosing a bank for a checking account are: no monthly fees (71%), online banking (66%), branch close to where they live or work (47%), no minimum deposit (41%) and mobile banking (38%).